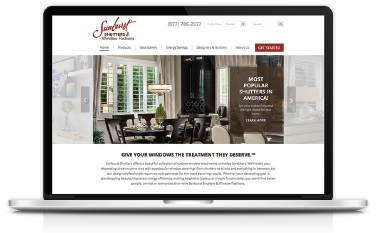 This project was all about re-branding the Sunburst Shutters & Window Fashions website and creating the look that would be used to influence their entire print campaign. The client asked us to take them from a 90’s retro look to timeless elegance, including visual conversion points that made an impact. With interior design marketing, a fresh modern feel to media is everything. 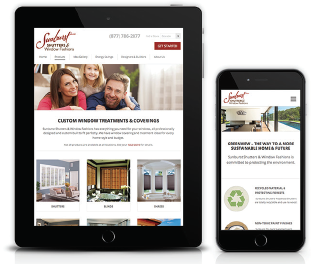 Recognizing more people are using mobile devices to shop and look for stores, it was a requirement that the website was developed to be fully mobile responsive. Zee Designs would take on a three-year consulting process across multiple medias: print, web, and video. The website itself was redesigned to have a fresh look and developed with modern features and functionality, all mobile-friendly. In addition, we actively consulted with another team that develops the store-specific websites to make sure the corporate brand look was carried consistently throughout all re-branding efforts, and the coding developed was providing the expected results. The website turned out to be a showpiece, as beautiful as it is functional. The exciting part is that every picture of products is from an actual installation. Anyone would want to move into the rooms pictured! products, care, and more. The site has an Idea Gallery to give site visitors inspiration for what interesting things can be done with the products offered, and how they will look when installed. There is also a section for Interior Designers and Builders. To involve customers in the marketing, we created a Share Your Shutters Contest feature. Customers take pictures of their own installations and share them with Sunburst Shutters to share ideas, join in the fun, and win prizes. GPS-friendly searches for mobile devices. Eye-appealing, interactive information rich content. A Consultation form for which the fields and designs stay the same, and each time it is loaded the image of the person on the form randomly changes. The images were carefully selected to show the diversity of the Sunburst Shutters market. Tabs were implemented on product pages to make navigation easy and information available without showing too much content at one time. On-page Search Engine Optimization (SEO) features were enhanced to provide detailed customization of metadata. A full-featured platform offers the Sunburst Shutters’ administrators a Content Manager they can use to update nearly all of the site’s content themselves. Through the process of our project adventures, we have been happy to reaffirm that the Designer Platform’s ZD-CMS™ is flexible enough to handle all the customizations required for state-of-the-art technology while delivering a beautiful, timeless website.